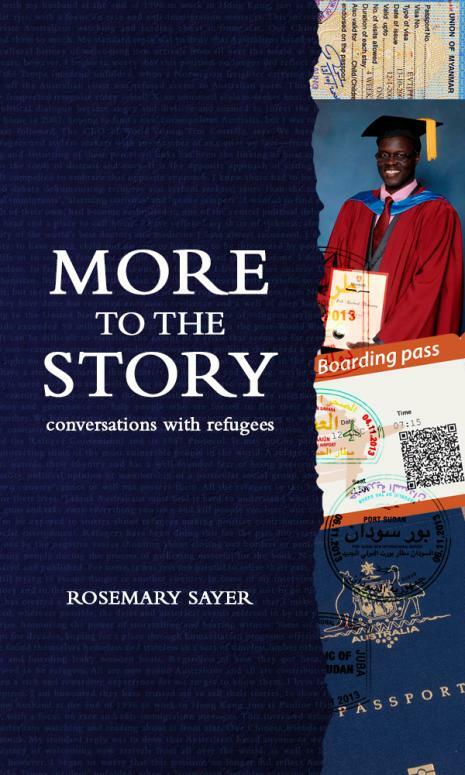 More to the Story, Conversations with refugees is, like similar books I’ve reviewed on this blog, a good-hearted book. It is written with good intentions: it’s a more than a gesture, it’s emblematic of a grassroots movement to change things because it’s written in hope that it can change the minds of people who are hostile to refugees. Its ambitious aim is to generate attitudinal change so that our political parties move away from their present punitive policies. That means shifting the attitudes of electors in the heartlands of current policy, in Western Sydney. It is a matter of ethics…. At a time like this when every day seems to reveal a despicable new violation of the most basic of human rights, it is heartening that there are writers like Rosemary Sayer and Chris Nguyen, and publishers such as Margaret River Press and Rag & Bone Man Press, who undertake projects like these not only because the stories are compelling and should be told, but because they care about the ethical health of our country and the plight of people who have simply found themselves in the wrong place at the wrong time, as any of us could. The title is purposeful: the book offers ‘more to the story’ than we see in the media. The refugee issue has become so vexed in Australia that labels and stereotypes have become the norm, so much so that even the language used has become debased. Sayer tackles this right at the start with three pages under the heading Names Matter: Definitions and Terms. Here we see the UNHCR definitions of asylum seeker, statelessness, and an explanation of the difference between refugees and IDPs – Internally Displaced Persons who are trapped inside their own countries, theoretically under the protection of their own government even if it’s that government that is persecuting them. There are clarifications of the terms economic migrant and the spurious term ‘economic refugee’. This section makes it clear that they’re not terms that are hard to understand. What goes on in the media and our parliament is wilful misuse of these terms to back up disinformation, stereotyping, and blaming. Having dealt with the language that muddies the water here in Australia, Sayer then goes on to tell the individual stories of her subjects. Each one of them, then, becomes a person instead of a statistic or a representative of a ‘problem’. Sayer’s commentary keeps bringing the stories back to Australian attitudes. When she writes about the dangers faced by a Karen woman in Burma, she prompts readers to imagine themselves in a similar situation because she says she can’t imagine this herself, because she’s always been safe, well fed, able to access hospitals and so on. This honesty about her own limitations gives the book a powerful authenticity. After that first meeting with Akec and her family, I had pondered about the meaning of home as I drove away from the restaurant and down the freeway, towards the lights of the city. It is a simple word, but one with complex definitions and meanings. For most, it starts out as a place where you are born and grow up and where you hold family gatherings and celebrations; love, laugh, eat and sleep, feeling comfortable and secure. It is a place from where you go to school, play, study and maybe even plan your future. I remember my childhood home from the 1960s in Hobart, Tasmania, in a simple weatherboard house where Mum, Dad, my five brothers and I squeezed into three bedrooms. It wasn’t just the physical structure that made our house a home; it was the emotional security that it provided. Whole lives will now be spent taking pieces of many different places and putting them together into a stained glass whole. Home is really a work in progress. It’s like a project on which they’re constantly adding upgrades, improvements and corrections. I’d like to think that this book might become widely read. If you’re still with me at the end of this, spread the word…. Review copy courtesy of Margaret River Press. Available from Margaret River Press; Fishpond: More to the Story: Conversations with Refugees and good bookshops everywhere. This is a great story. A friend told me about the Iranian refugees in his little country town who chose to make a weekly trip to the market in Melbourne to buy their fresh food. When asked why they did that, they said it was so wonderful to know they could leave home knowing they could come back to it in safety. That puts it all in perspective, doesn’t it….